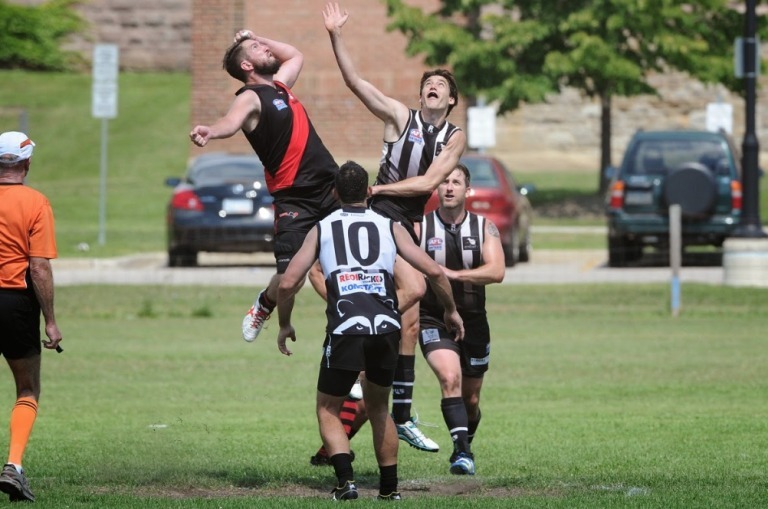 Div.1 lost their first game since early July, succumbing to the undefeated Rebels in the final quarter by six goals at Humber South on Saturday. The Dingos fought tooth and nail for three quarters, only trailing by a goal at three-quarter time, but injuries to Alex Aitken and Joe Carrig set them back and the Rebels ran away with a solid win in the last term. Both teams had outs: The Dingos were missing Wade Edwards, Heath Neville and Tom Evans; The Rebels were missing Morgs and Prendergast. Jedi Caron played his best match for the season and was awarded the BOG award for his attacking defensive work and great skills. Mike Ladd was given the task of running with Rebel’s midfielder Kon and did a great job. Mike Karas, Rainer Haycraft and Shaun McKay were also among the best on the day. The Dingos have a long weekend rest this week before they travel to Ottawa for their clash with the Swans. Every game is a must win game from here. Although with the Blues having a fairly decent run home, it will be hard to overtake them to qualify for finals. Interesing times ahead in the run home. Goals: T.Humphries (2), C.Turner-Bloom, S.McKay. Best: J.Caron, M.Ladd, S.McKay, R.Haycraft, M.Karas. For more pictures of the Rnd9 game please check out Rob Colburn’s AFLO snaps here. The image above is from his collection.